I'm in a book club with my sorority alum group and we read fun (and serious but sometimes I miss those months) books and eat food and discuss the book (and other serious and fun topics) and this month we did something super cool. We read a book written and published by a member of our group! 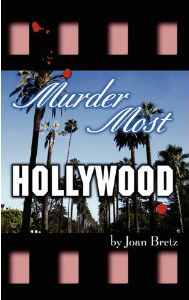 Joan Bretz told us a little about her life and how her first mystery Murder Most Hollywood came to fruition and they were some fantastic stories. Joan has worked in Hollywood, on Broadway and now lives in McLean, Va where she is finally doing what she loves most, (can you guess what that is?) writing. I'm not going to give anything away in case you guys want to read it (on your beach vacation this summer, it would be so perfect for that) but its a fun, easy read that keeps you involved with the characters and has some fun twists along the way. Nena (that's the main character) is a private detective and she has to find the muse (also girlfriend) of a huge celebrity when she goes missing. Read it!